Anna Flanagan took her tally to 20 international goals for Australia as the Hockeyroos beat Japan 3-1 in Perth. The Canberra-born defender struck twice from penalty corners either side of Emily Smith’s goal to help the Hockeyroos to a fourth consecutive win over the Japanese in the five match series. It was Smith’s fifth goal of the series as the Crookwell forward finds herself in good form ahead of the Hockeyroos’ next challenge, a six nations tournament in Hawkes Bay, New Zealand, which begins next week. Before the match, Commens made a presentation to Kobie McGurk, who retired from international duty in November. After a goalless first half Flanagan broke the deadlock ten minutes after the restart and Smith doubled the Australian advantage almost immediately. Japan reacted quickly with Akane Shibata on target to reduce the deficit but that there would be no way back for Japan before Flanagan’s late penalty corner on the stroke of full time gave the Hockeyroos a 3-1 win. The fifth and final Test takes place on Friday at 7:30pm AWST (10:30pm AEDT) at Perth Hockey Stadium. Hockey New Zealand has confirmed live streaming for both Black Sticks Women vs China games in Taupo next week. The two tests at 6pm on Monday (31 March) and Tuesday (1 April) are part of the Black Sticks’ build up to the Hawke’s Bay Festival from 5-13 April. It is the first time that the Black Sticks Women have played in Taupo and New Zealand last played a series against China in May 2012 in Beijing, winning the three test series 2-1. Both games will be streamed live on the Hockey New Zealand website from 6pm through the link below. Many Black Sticks may use the Korea hockey series to solidify their spots ahead of two major tournaments, but few will be as determined as Jordan Grant. The New Zealand women's side face Korea tonight and tomorrow afternoon at Auckland Grammar, with Grant possessing a particular desire to impress the coaching staff. 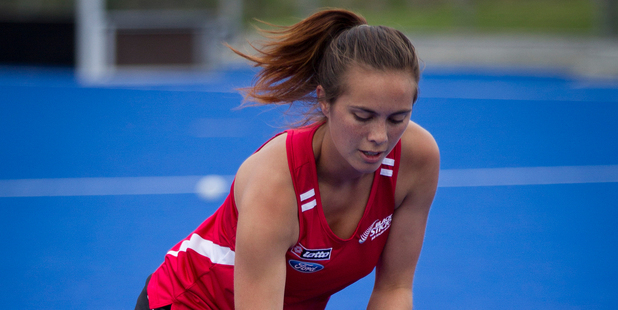 The 22-year-old recently left Christchurch to move to Auckland and increase her chances of nailing a place in the Black Sticks squad, encouraged to train with national coaches and numerous teammates. Grant hopes a good performance against Korea will make the move worthwhile. "It's quite different," she said of her new home. "The traffic for a start, I'm trying to get used to it - I have to leave an hour at least before trainings to make sure I get there on time. "But it's so good having [coach] Mark [Hager] and [assistant] Sean [Dancer] up here. I'm used to training with three players in Christchurch - me, Kayla [Whitelock] and Rachel McCann - and up here there's like 22 of us." Being immersed in the national set-up on a daily basis will hopefully have its advantages when the squad is selected for both next month's Hawkes Bay festival of hockey and, more importantly, the World Cup in the middle of the year. "I think that's a goal for all of the girls, but definitely for me," Grant said. "It's the pinnacle event in hockey this year, so we're all striving to get a spot into the team." Grant's inclusion seemed unlikely only a couple of months ago, when she was plucked from the national development squad and thrust into action at the three-nation tournament in San Diego. That went well enough for the versatile midfielder/striker to earn promotion to the New Zealand squad on a fulltime basis, a call-up that came as a complete surprise. "I was really stoked with my performance [in the US] but I never for once thought it would happen," she said. "I settled in quite well and I think the step up was just about getting used to the pace." That transition will continue against Korea, with Grant taking modest goals into the series. "I probably just want to play the best that I can play. That's been making me practise on my tackling a lot, so hopefully I can go good at that in the games." LAHORE: Pakistan will take part in the upcoming Asian Games scheduled to be held in South Korea in September this year. The decision in this regard has been taken in the executive body meeting of the Pakistan Sports Board (PSB) held under the chairmanship of Inter-provincial Minister Riaz Hussain Pirzada. The government has decided to even allow the Pakistan Hockey Federation (PHF) to make contact with Pakistan Olympic Association (POA) chief retired Lt Gen Arif Hassan, whose body is the only one in Pakistan recognised by the International Olympic Committee (IOC). Sources said that PHF secretary Rana Mujahid who attended this meeting raised the issue of sending the national team to the Asiad where Pakistan defend the title. Furthermore, it is instructive to note that winners of the Asian Games will qualify for the next 2016 Games scheduled to be held in Brazil. It is also important to note that the Inter-provincial Ministry is yet to recognise Arif-led POA with the former forming its own POA headed by Akram Sahi. Nonetheless, Sahi-led POA despite all efforts has failed to field a single player in any sports gala held under the umbrella of the IOC with the IOC only recognising Arif-led POA. Also, the PHF has also been following instructions of the government-backed PSB which is in conflict with the IOC-recognised Arif-led POA which has resulted in national team failure to even take part in the Commonwealth Games to be held in Scotland this year. Keeping all this in mind, PHF decision to allow team to participate in the upcoming Asian Games is being welcomed in all quarters. Meanwhile, the sources further said the step taken by the federal government is not enough and it must opt to contact Arif-led POA to abolish the controversial clauses from its national sports policy besides making PSB rules more in line with instructions of the IOC. KARACHI: Strong departmental teams thrashed their weak regional rivals on the second day of the 28th Pakistan national women hockey championship here on Thursday. Railways destroyed minnows Sindh Whites 25-0 and Army smashed Punjab 9-0. Since the day one a visible difference has been noted between the standards of departmental and regional teams. The regional teams, especially Balochistan, KP and Sindh, lag far behind the professionally sound teams of WAPDA, Railways and Army. As many as four hat-tricks were scored in the match between Railways and Sindh Whites. Railways’ forwards destroyed Sindh Whites, and the entire game was played in Sindh Whites’ half. Railways kept ball control and the inexperienced Sindh girls failed to respond to the moves made by the Railways players. Forwards Hina Kanwal and Nirma scored six goals each; Madiha Manzoor struck five and Aqsa Manzoor hit four. WAPDA defeated HEC 3-0. Ambreen Ansari, Ishrat Abbas and Kulsoom scored one goal each. Punjab Colours outshined KP, beating them 6-0. Punjab Colours kept ball possession and played according to their will. They scored three goals in the first half and three in the second. Shahneel Baber and Mariam Mansha netted two goals each. Ramsha Ilyas and Sidra Ayoub scored one goal each. Army thrashed Punjab Whites 8-0. Iqra Javed, Afshan Naureen and Sahirah Kanwal scored two goals each for Army. During the match, Punjab Whites’ Nadia got injured when a powerful hit of a rival player hit her abdomen. She fell on the ground and was shifted to hospital through an ambulance, which had to be called to HCP on emergency basis by the organisers. It must be mentioned here that PHF’s Women Wing twice wrote to Jinnah Hospital’s administration on the letterhead of the PHF to deploy an ambulance on permanent basis during the championship, but till the end of the second day and the injury of Nida, the hospital had not sent the ambulance. Jinnah Hospital is located just behind the HCP. The condition of the injured girl was stated to be better but she was kept in the hospital for observation. NEW DELHI: India men's hockey chief coach Terry Walsh on Thursday said that a new set of techniques have been introduced in the national camp here and the players were adapting well to them ahead of the upcoming World Cup. "We are majorly working on areas as that of opposition's defence. Considering the styles and techniques on which we are focusing upon, it's relatively different for the team, although enjoyable and challenging," Walsh said after team training session at Major Dhyanchand National Stadium here. "Strategies like players swap, wherein other team sometimes changes for about 70 times in a game, in that way we need to overcome the mentality of going off the pitch. It has successfully started implementing in our team as well which is challenging yet very interesting," he said. Walsh said there's a huge scope of development for the team and the European tour before the World Cup will give the players the chance to implement the new techniques. "I can see a huge scope of acceptance within the team for trying new things and techniques in a more realistic way. We are preparing the team to avoid unpredictable circumstances in order to improvise more efficiently," the Australian said. "European Tour which is soon taking place surely provides a good opportunity as even the pitch is similar to the one in World Cup which is why it is happily accepted by everyone." Talking about the team performance in the training sessions, Sandeep Singh said, "These practice sessions are turning out to be fruitful for all the players and is going on pretty well too. We are working really hard and putting out best efforts for the World Cup. "Terry and the supporting staff are working really hard on our scoring skills as well as the fitness. New techniques introduced by Terry are really significant and we think it will be very advantageous for us in the future games." Jude Felix, who was on his first day as coach, said, "It feels pretty good and exciting to be a part of team. Players are also incredibly excited for World Cup and the upcoming European tour and are giving their cent percent in preparatory camp. "The boys are great and we have to now focus more on polishing their skills. Things have become very much professional nowadays and especially the new set of techniques which are used in the camp are very essential for the World Cup and other upcoming tournaments." CHENNAI: Services Sports Control Board stormed into the semifinals with a crushing 7-0 win over Kerala in the 4th Hockey India Junior Men National Championship 2014 (Division B), on Thursday. Services Sports Promotion Board and Steel Plant Sports Board registered third consecutive wins to stay on the top of their respective groups. In Pool A, SPSB had an easy outing as they blanked Puducherry 4-0 while SSPB trounced Kerala 7-0 in a group C encounter on day four. While Bengal Hockey Association beat Gujarat 13-3 to win their second match in a row, Bihar hammered Assam 13-4. The last match of the day was a closely contested one as Andhra Pradesh edged past Vidarbha Hockey 4-3. Results of the Day- Pool A - Steel Plant Sports Board 4 Tejesh Deepak (18 and 31 min), Santosh Baxla (28 min), Shilanund Bilung (70+ min) Vs. Puducherry 0. Pool C - Bihar 13 Subash Sanga (5, 34, 45 and 59 min), Ravi Kumar (1, 7 and 18 min), Bishram Dodray (8 and 63 min), Manish Kumar Kashyap (21 min), Anand Kumar Bara (30 min), Jony Kumar (48 min) and Prem Rajan Ekka (56 min) Vs. Assam 4 Bedadyuti Chakraboraty (11 min), Pankaj Basu Matary (46 min), Minaj Ali (66 min) and Rituraj Boro (69 min). Pool C - Services Sports Control Board 7 Ramandeep (4 min), Navpreet Singh (5, 39 and 42 min), Naveen Minz (8 and 55 min) and Anup Minz (62 min) Vs. Kerala 0. Pool B Andhra Pradesh 4 Ramkrishan (20, 27, 41 min), Chandar Shekhar (54 min) Vs Vidarbha Hockey 3 Ahfaz Pathan (32, 66 min), Prafulla Lohangare (58 min). Ramon Alegre says his RC Polo de Barcelona side are in good shape to get the better of Reading in the KO16 following his club's win last week in the Copa del Rey. He and his brother David were reunited at the Catalan club this season after spending a number of years at other clubs around Europe while also lining out against each other in the Indian Hockey League. Back at Polo, they helped them claim the silverware last week with David scoring a classy winner against Atletic Terrassa with just over a minute to go of the cup final, winning 3-2. After the competition, thoughts turned straightaway to the Euro Hockey League challenge ahead and Ramon is in upbeat form about their chances. "I think we have plenty of chance to progress," he told RFEH.com. "We are playing an English team, playing in a very good league but we have to focus on ourselves. I think we have good players and are working very well together and that gives us a boost going into the Euro Hockey League with a big chance of winning. "When you are in Polo, your objectives are the highest possible. Last year, they had a spectacular season in which they won everything and we want to be in that position to do it again." Speaking about his return to Polo after a spell with Kampong, Ramon added: "I've been four years in the Netherlands, playing hockey, working, living a good experience but I was eager to return. "Barcelona is a city where life is good. To be near friends and family is a plus and I enjoy playing hockey here, close to everything. At Polo, I have friends and, above all, is David, my brother to share a dressing room with!" A last minute trademark drag-flick from a penalty corner by Ahmed Ewis posted a 3-2 win for Khalsa-A over HKFC-A in the final week of the Hong Kong Hockey Association Premier Division confirmed Khalsa-A’s lead position for the 2013-2014 season. Khalsa won 14 of their 16 games and drew the other two matches to win the Hong Kong Premier Division title. Throughout the season they scored 97 goals and conceded only 21—demonstrating their strong mid-field, defence, and their exceptional goal scoring capability. Only Football Club (HKFC-A) came close with an 85-25 tally; Punjab-A, the second placed team in the standings, had 71-40. Khalsa’s two drawn matches were in the first half of the season—when they tied a match on Sept 29 against a greatly improved Shaheen-A side 5-all; then faltered again on Nov 17 against Punjab-A 3-all, when Punjab had their four ex-Olympians, Sahail Abbas, Mudassar Ali Khan Waseem Ahmed and Sukhwinder Singh Gabbar in their team. That November match against Punjab was the most difficult for Khalsa during the season. They were losing 2-nil at half-time and had played in a reserved manner against the experienced Punjab International players. It took Manager/Coach Gurcharan Singh to inspire confidence and realign his team’s strategy at half-time. After the mid-game discussions Khalsa came out with a far more purposeful approach and moved into a 3-2 lead before Punjab scored to tie the match in the final minutes of the match. This comeback gave the team great confidence for the rest of the season and they then won all of their matches to take the title. Punjab-A also finished with a 2-nil win against Valley-A to take second place in the Premier Division standings ahead of HKFC-A. Punjab-A have maintained their high standard of play after three of the four Olympians returned home. Meanwhile, Club have also had a good season playing hard and defending well, but have fallen a little behind in goal scoring effectiveness. Khalsa have three players in the competition’s top ten goal scorers: Ahmed Ewis, Inderpal Singh and Harry Bal, with a total goal tally of 43 goals. With games still remaining to be played by Shaheen-A and Valley-A, the Premier Division top goal scorer table is again headed by Ahmed Ewis of Khalsa with 26 goals. Valley’s Didier Demaret is in second place with 17 and Arif Ali of Shaheen is currently lying in third with 13. Four players have 9 goals: Angus Cameron (HKFC-A), Inderpal Singh (Khalsa), and Baljit Singh and Satwinder Singh both of SSSC-A. HKFC-B won their match against SSSC-B 5-1 to confirm their standing at the top of Premier Division (B) giving them a credible 6th place overall in the standings. Pak-A beat KNS-A 8-5 to move them into 7th position one place above KNS. Two other Premier Division league matches, Shaheen-A against SSSC-A and Elite-A against KCC-A, will be played on Mar 30. No date has yet been set for the postponed Valley-A vs Shaheen-A match. KUALA LUMPUR: Defending champions Perak and five-time former champions Kuala Lumpur booked their semi-final berth in the boys’ catergory of the MHC-Milo Under-16 hockey championship in Kangar. They join Penang and Selangor in the last four. Perak defeated Negri Sembilan 3-1 in the crucial match in Goup A while KL had little trouble beating Terengganu 3-0 in Group B at the Kangar Hockey Stadium. Perak have completed their matches but will have to wait for the Selangor-Kedah match on Friday to find out if they top the group. If Selangor win, they will head into the semi-finals as Group A champions. In Group B, Penang and KL are the two teams who have booked their berth in the semis and their final matches on Friday will also decide which team tops the group. Penang will play Terengganu while KL will play Kelantan. KL coach K. Embaraj said that the group champions will likely be decided on goal difference. “We are not overly concerned as whoever you play in the last four will be a tough team. In the age group tournament there are really no favourites. Every match is crucial and the semi-finals will be a diffeent ball game as you cannot afford to make any mistakes at that stage,” he said. “We plan to use the match with Kelantan to try out a few ideas and variations. So the results will not matter to us as we are already in the last four. I just want the players to use the opportunity to learn and maintain their form,” he said. In Thursday’s match, KL’s goals came through Mohamed Fadhzil (26th minute), P. Kavinash (47th) and Mohamed Fikri (65th). Champions Perak went all out for a win knowing that a defeat would put Negri Sembilan in the semi-finals. Negri took the early lead in the 19th minute through a field goal by Jefri Jaafar. But, it wasn’t long before Mohamed Zaidi scored from a penalty corner to give Perak the equaliser in the 24th minute. Mohamed Najme and Syed Syakir ensured full points for Perak with goals in the 48th and 61st minutes respectively. Friday’s matches will be a formality for the semi-finalists in the boys’ category. The semi-finals will be played on Saturday. Meanwhile in the girls’ competition, defending champions Penang will meet Negri Sembilan while Pahang take on Kelantan in the semi-finals at the Kuala Perlis turf on Friday. AFTER being held to a 2-2 draw by Penang on Tuesday, Kuala Lumpur were back to their best with a clinical 3-0 win over Terengganu in the Milo-MHC National Under-16 tournament in Perlis yesterday. A technically superior KL side were in control throughout the match and field goals from Mohammad Fadhzil Ashraff and Kavinash Panicker Thevendran in the 26th and 47th minutes as well as a Muhammad Fitri Khairul Ariffin penalty corner in the 65th gave the five-time winners a comfortable win in the Group B encounter. Coach K. Embaraj said he was pleased with the victory, which has guaranteed them a spot in the semi-finals tomorrow, and will look to experiment in their last group match against Kelantan today. "I think we played much better compared to against Penang. The boys created a lot more space and were more composed," said Embaraj, whose charges have only dropped points against Penang in the tournament. "Physically, Terengganu are quite strong but their players are lacking in the basics of the game. I notice this a lot among teams competing here. "Now that we have secured qualification (to the semi-finals), I want the boys to learn something new in our last game against Kelantan as this tournament is not just about winning. "If it (new gameplan) turns out to be a success, we might also apply it in the semi-finals." Defending champions Perak, who drubbed Kedah 4-0 on Wednesday, also secured their place in the semis after notching a 3-1 win over Negri Sembilan yesterday. RESULTS -- Boys' Group A: Pahang 3 Perlis 1, Perak 3 Negri Sembilan 1; Group B: Kuala Lumpur 3 Terengganu 0, Johor 5 Kelantan 1. Girls' Group A: Kedah 5 Johor 1, Pahang 1 Penang 1; Group B: Selangor 2 Negri Sembilan 2, Kuala Lumpur 17 Perlis 0. TODAY -- Boys' (Kangar Stadium) Group A: Selangor v Kedah (7.15am); Group B: Penang v Terengganu (9am), Kuala Lumpur v Kelantan (3pm), Sabah v Johor (5pm). Girls' (SMK Kuala Perlis) semi-finals: Pahang v Negri Sembilan (3pm), Kelantan v Penang (5pm).